Disclosure: Influence Central received samples of the products discussed below, in order to facilitate our reviews. All opinions are our own. A bevy of beverages await you, because there exists something for every taste and preference in the world of drinkware & brewers these days! Below, find some items that earned our stamp of approval. With kids soon heading off to summer camp, day-long bike rides, and little league or soccer practice, you may want to pick up a few of these 22-ounce Polar Bottle Ergo Spectrum insulated water bottles! The dual-wall design keeps water cold for 6 hours and the ergonomic design means they prove easy to hold. 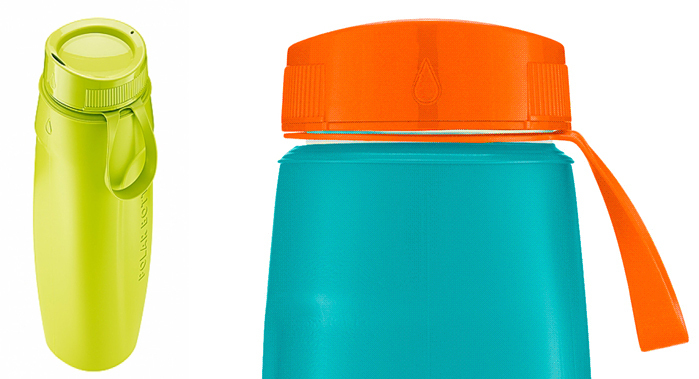 Kids will love to mix and match the boldly colored bottles and caps (easy to identify on the sidelines), while moms will love that the leak-proof Polar bottles can be popped into the dishwasher and are BPA-free! Contigo continues to spin out innovative, new drinking products, and this cup proves no exception. While we all may love the convenience of an on-the-go insulated coffee mug, some of us don’t like the feel of the plastic or stainless lip in our mouths. With the Knox Ceramic Mug, you don’t taste your mug, you taste your morning beverage! 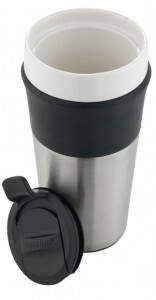 Featuring a ceramic lip, this mug remains a superior insulated, stainless steel on-the-go mug, keeping our beverages hot (or cold), with excellent portability! We all know we should keep hydrated throughout the day, especially when active. 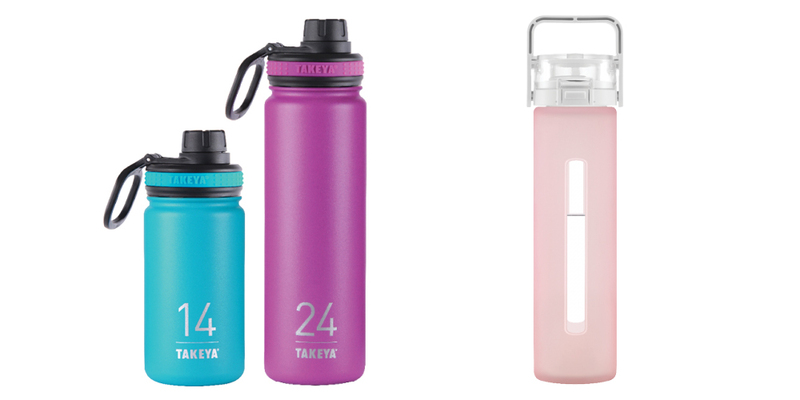 Takeya’s Thermoflask™ Stainless Steel Bottles and Glass Water Bottles make it so easy! With gorgeous colors (bright and bold, or pretty pastels) and incredible design, you’ll easily consume your 8 glasses a day with these stylish bottles in-hand! Takeya also makes delicious loose leaf iced tea blends, ideal for staying hydrated over warmer months! If you prefer a less “sporty”, more elegant look to your on-the-go beverage holder, you’ll love the gorgeous, new Aladdin Topo Stainless Steel Mug – its tall, sophisticated rippled pattern appeals to fashionistas and professionals alike! Although too tall to a Keurig single-cup brewer, its built-in loose leaf tea infuser quickly makes up for it, delivering freshly-brewed, artisan tea, on the go. This mug marries beautiful design and useful functionality effortlessly. Mr. Coffee knows that for true coffee lovers, pre-fab pods simply won’t do. So they created Mr. Coffee Single-Serve Brewer for home (or work!) that uses ground or whole coffee beans, in a size perfect for enjoying at home or on the go (8oz or 16oz)! Nothing beats the aroma of freshly-ground coffee, and this is a cup of joe you can personalize with your favorite blend. This is the little brewer that could, as it brews delicious coffee in minutes. Removable filter basket lifts out for easy cleaning and can be washed in the dishwasher.